Scientists have made a crucial new discovery into how a group of ancient microbes that can survive in some of the world's harshest environments, propel themselves forward. An international team of experts, led by Dr Bertram Daum of the University of Exeter's Living System Institute, have revealed the structure of the unique whip-like appendage found on archaea, which rotates like a propeller to enable these cells to swim. The structure, called the archaellum, is used for movement and also to allow the microbes to adhere themselves to surfaces, helping them flourish in their current environments and also to colonise new ones. The researchers studied a particular type of archaea called Pyrococcus furious, which thrive without needing oxygen and at a temperature of 100° C - the boiling point of water. 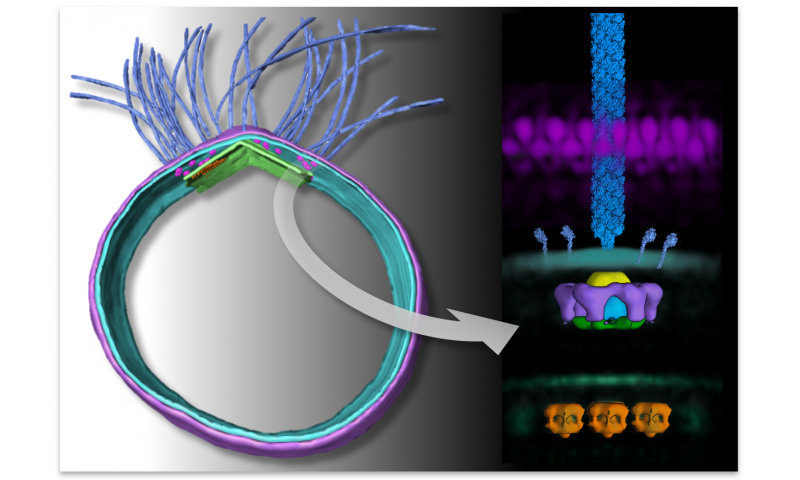 Using state-of-the-art electron cryo-microscopy at the Max Planck Institute of Biophysics in Frankfurt (Germany), the research team have visualised this vital, yet previously poorly understood propelling motor in 3D and at so-far unachieved resolution. They say that the new research will pave the way for a deeper, molecular understanding of the swimming motion of the archaea. The study is published in scientific journal eLife. Dr Daum, a Research Fellow from the University of Exeter's College of Engineering, Mathematics and Physical Sciences said: "the machinery that drives these microorganisms can appear strikingly simple but it is extremely difficult to study in depth. This new research has allowed us to create, for the first time, a detailed model of the structure that propels the archaea, and as such helps them to thrive and survive in places that so much of life would perish. "More than that, this could have an incredible impact on synthetic biology and by understanding how archaea move, we are able to provide a new idea for future medical practices. Understanding the molecular propeller in detail could help scientists create motors for minute artificial capsules, small enough to explore inside the human body and help combat infectious diseases or cancer." As well as thriving in diverse and often harsh habitats across the world, such as boiling hot springs, salt lakes or deep sea vents, archaea are also found in the human digestive system and have been implicated as playing a role in obesity. Dr Daum added: "We are really excited about our structure of the archaellum machinery because it has many downstream implications. Not only does it teach us about how life can exist at extreme conditions here on earth and potentially elsewhere in the universe, but it also provides us with a powerful and versatile tool to create revolutionary technology that works at the level of molecules." Structure and in situ organisation of the Pyrococcus furiosus archaellum machinery is published in eLife.